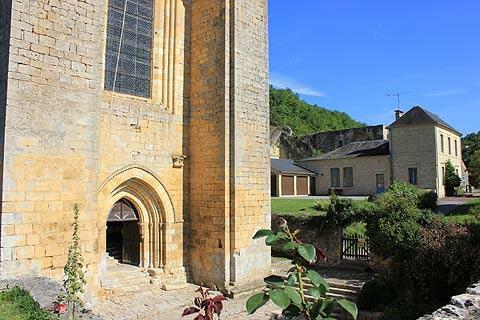 Saint-Amand-de-Coly is one of the most beautiful villages in France and is situated to the north of Sarlat in the eastern part of the Dordogne department. 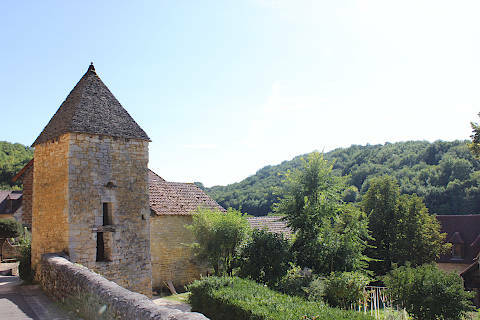 It is in a lovely wooded setting between Sarlat and Lascaux (10 minutes drive), with Montignac a little way to the west. 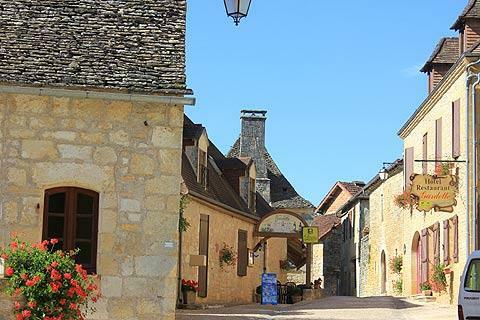 Saint-Amand-de-Coly is a lovely traditional Dordogne village, with the houses being fine examples of the local Perigord architecture, with their tiled roofs and yellow stone walls. Some of the buildings still have lauze (stone) roofs which are the traditional roofs of the area but very few remain. The village is dominated by its large church. 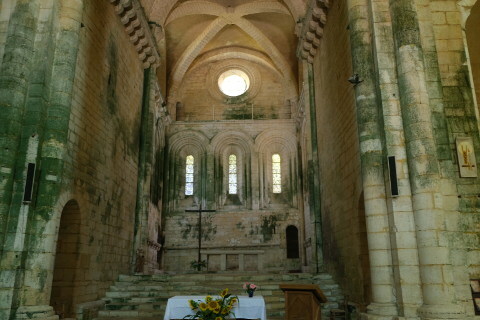 The church was constructed in the 12th century on the site of an earlier abbey chapel. It has been largely renovated and reconstructed during the 19th-20th centuries, and is an unusual combination of gothic and roman style churches. 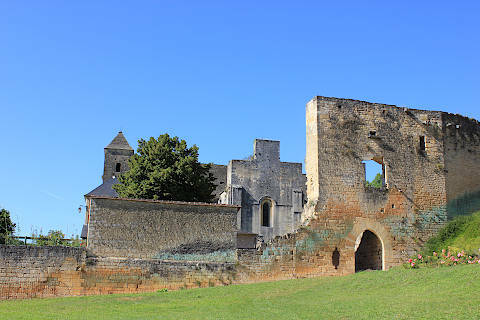 It was fortified in the 14th century and its huge entrance/bell-tower has a strong room above it. The church is next to the abbey which is now in ruins but is a pleasant evocative spot in the middle of the village. All the buildings in the village are very attractive with their golden walls, wooden shutters and steeply sloping roofs but the old hospital seen through its stone arched gateway is a particularly attractive building. The hospital was originally built in the 14th century but most of the current building is 18th century. Also to see in Saint-Amand-de-Coly are the lavoir, once the communal clothes washing area for the village, the village well and the communal bread oven. On the edge of the village is an old tobacco barn which has been renovated and is now a shop selling regional products. While the village is small and Saint-Amand-de-Coly has limited facilities you will find a cafe and shop selling regional products. 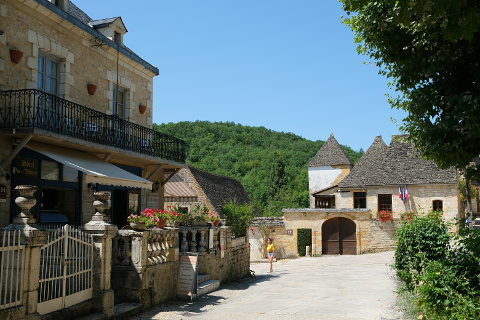 Of course the 'famous' sites such as Lascaux, Sarlat and Montignac will be on your list of places to visit nearby. Close to St Amand-de-Coly you can also see the attractive Château de la Grande Filolie, a castle dating from the 15th century and in an attractive park and woodland setting. Another lovely village near Saint-Amand-de-Coly is La Cassagne with a roman-style church, a 15th century presbytery, and the source of the River Coly. There is also a 13th century 'grange aux dimes' which is a barn used to collect the agricultural products which were the taxes imposed on the village in medieval times.